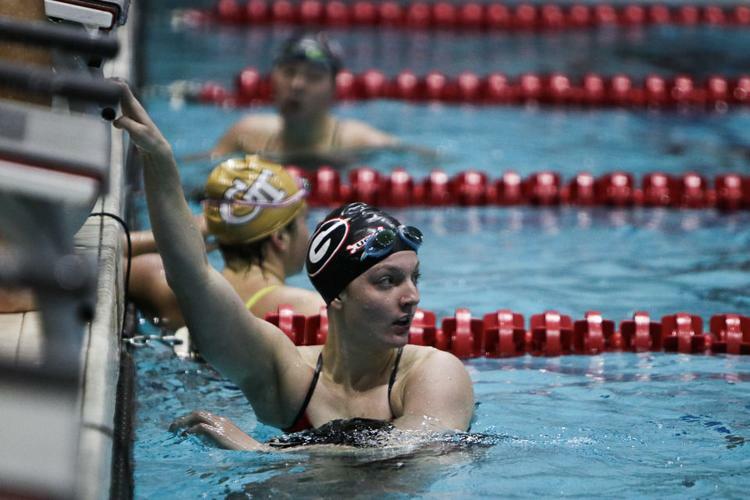 Following the conclusion of the Georgia Fall Invitational, the Georgia swimming and diving’s women’s team finished second while the men finished third. The Georgia women fell to Michigan who won with 944 points. The Lady Bulldogs had 835 points. The Bulldog men finished third with 795.5 points. Beating out the men were California in first and Michigan in second. Both the coaches and athletes felt this meet wasn’t about winning or placing. For them, it was about seeing where the team is at, tracking individual progress, and gearing up for the rest of the season. Junior Javier Acevedo returned to the pool this weekend for the first time since a foot injury. In the final day of the meet, he placed second in the 200-yard backstroke, recording the second fastest time in Georgia history. The only time faster than the one he earned yesterday is his own. He now holds the record for both the first and second fastest times in school history. Freshman Dakota Luther had a notable weekend as well. On the final day of the meet, she finished first in the 200-yard butterfly, inserting herself into Georgia record books with the fifth best time in school history. She also was a part of the women’s relay that made the A-Cut on night two of the meet. This cut secured the relay a spot in the NCAA tournament. Bauerle called Veronica Burchill the “player of the game.” The junior earned a third-place spot in the 100-yard freestyle. She set a new personal record in the event at 47.37. This left her tied for the fifth best time in Georgia history. More than her performance in the pool, coaches and teammates praise Burchill for her role as a leader on the team. She feels that stepping into this leadership role was easy for her, as past teammates and leaders paved the way for her to do so. “I just started being the best teammate I could possibly be, and I think being a great teammate is essential to being a great leader,” Burchill said.